I visited the Pi Hut for a day! 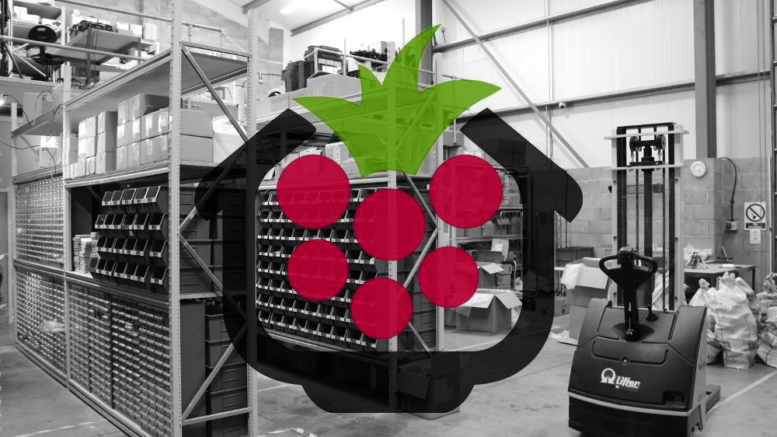 This is the first of what may turn out to be an entire series of visits to local Raspberry Pi stores and organisations, as I take a little break from my CCTV and robot arm projects. The term “I’m in you” is something that seems to be widely used by fellow Pi enthusiasts when visiting a new area or town for a Raspberry Jam – such as “Southend, I’m in you” – so I’ve adopted the somewhat vulgar term for these posts. Last month I took the long and twisty drive through the country to see the Pi Hut superstore owner Jamie Mann and his team. It’s a visit we had planned for a while but had to delay it after the Pi3 launch took over Jamie’s life for a few weeks! 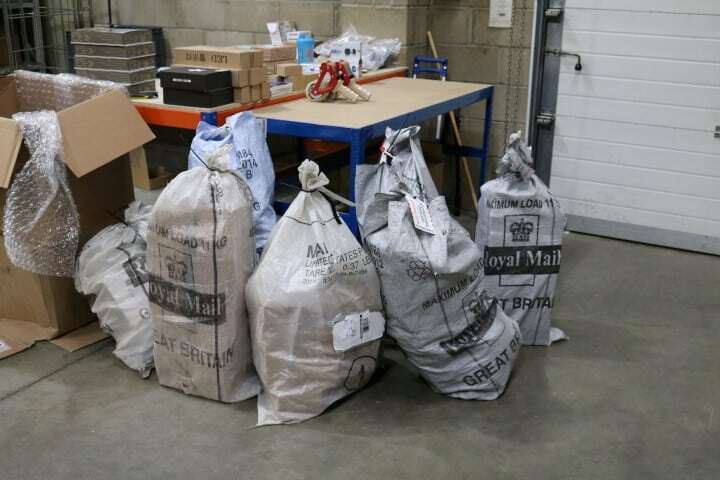 My plan to visit started when Jamie posted a photo on Twitter (a bit like the one below) of a large pile of orders about to be shipped. 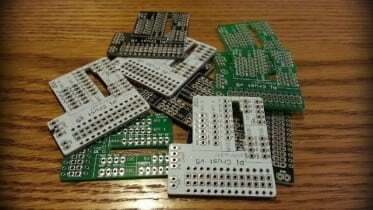 I replied stating my amazement, which sparked a conversation around how much ‘Pi stuff’ sells and how big the scene really is. Jamie then invited me over to come and see for myself. The Pi Hut HQ is about a 1.5 hour drive from my hometown of sunny Southend-on-Sea, approximately 55 miles away. It’s amazing how much this little country of ours can change in a distance of less than 60 miles. I left Southend waving goodbye to concrete ‘everything’, guns, rappers and crime expecting to see much of the same at my destination. Wrong! 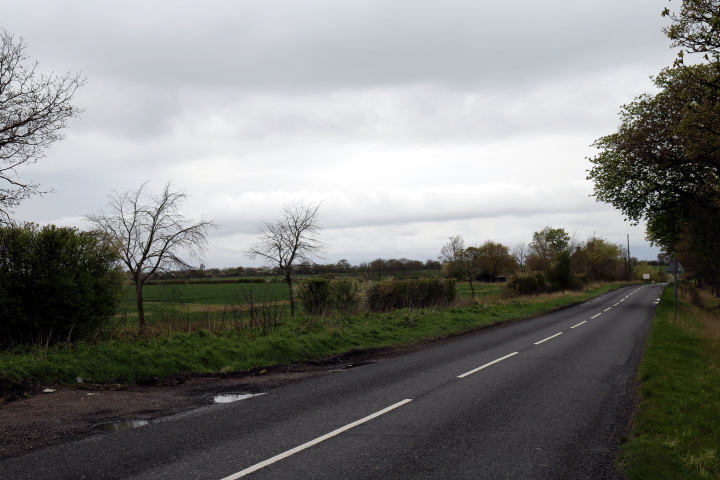 Jamie’s bunker of Pi is hidden in a little town called Haverhill, surrounded by fields, trees and picturesque villages. Jamie tells me the only guns used here are for hunting – no drug turf wars around here then it seems. It’s NOTHING like Southend! To give you a feel for how different our areas are, a good example is a village I drove through called Steeple Bumpstead. Whilst Southend has a lot of tower blocks and flats, the residents of this village were at all out war against plans to build a development – check out the picture below! I finally arrived mid-afternoon. 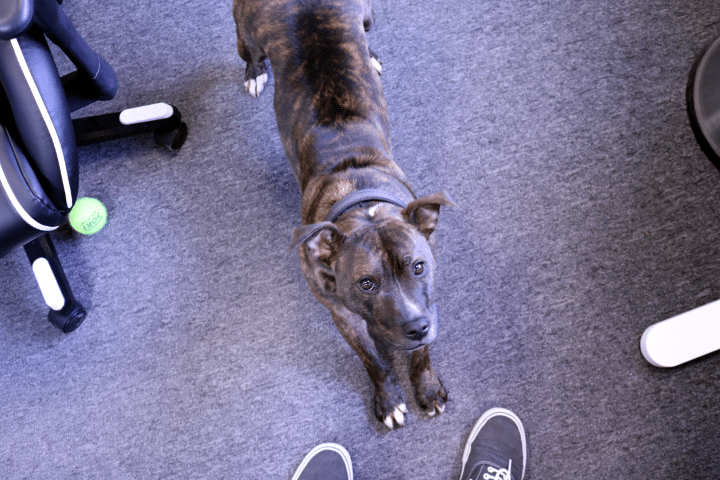 Jamie welcomed me in to his office where I met his dog Rudi. She helped break the ice by letting off a bit of wind from time to time…nothing quite de-formalises a meeting like a fart! You can tell a lot about a man by his office, so this was a good way to really get to know Mr Hut himself. Why does everyone have a 3D printer except me? In the other corner of the room is Jamie’s cockpit. He’s got a serious looking chair, which of course tells us that he’s the boss man. 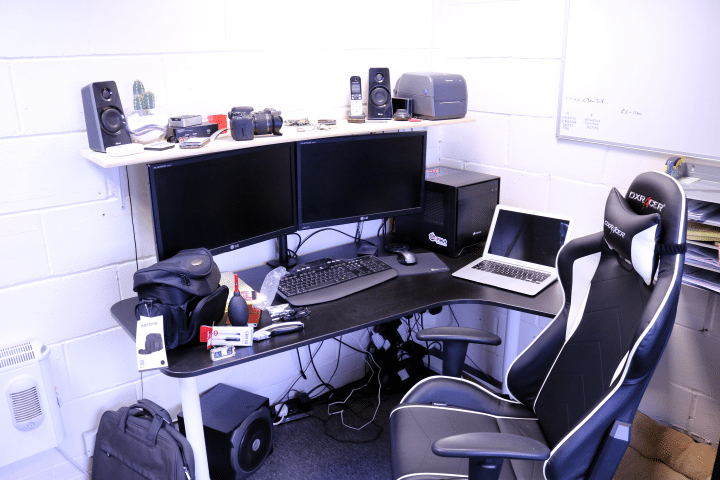 You’ll also notice 2 screens, a laptop, a camera bag (with his new Canon 750D just like me) and a big ol’ black box in the corner which I’m sure does something interesting. He’s certainly into his toys, which confirmed that we would get on well. Whilst sipping coffee in his office I asked Jamie a few questions about the history of the company. Whilst I had previously listened to his success story on the (now closed) RasPi.Today podcast, at the ripe old age of 30 my memory isn’t quite what it was. Jamie shared how he started out selling pre-imaged SD cards when the Raspberry Pi first came about, as back then it wasn’t quite as easy to set up an SD as it is today. 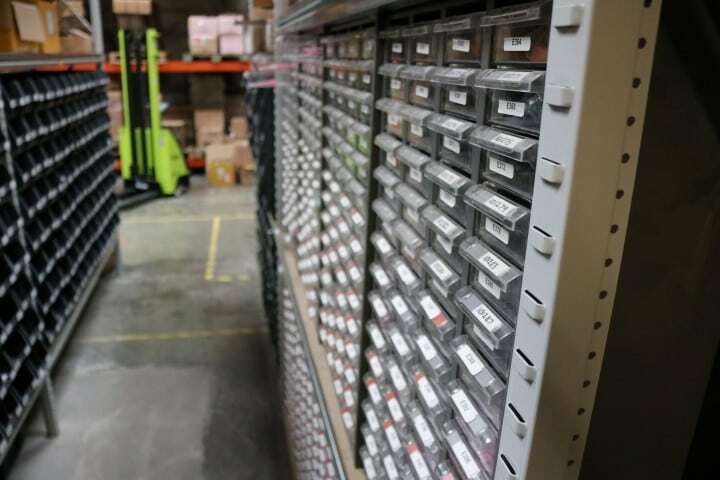 From there he moved on to cases…and continually added more and more products. After a quick chat in his office, Jamie gave me a tour of the rest of the building to see how everything hangs together. The first thing I noticed was the wall of boxes at one side of the warehouse. 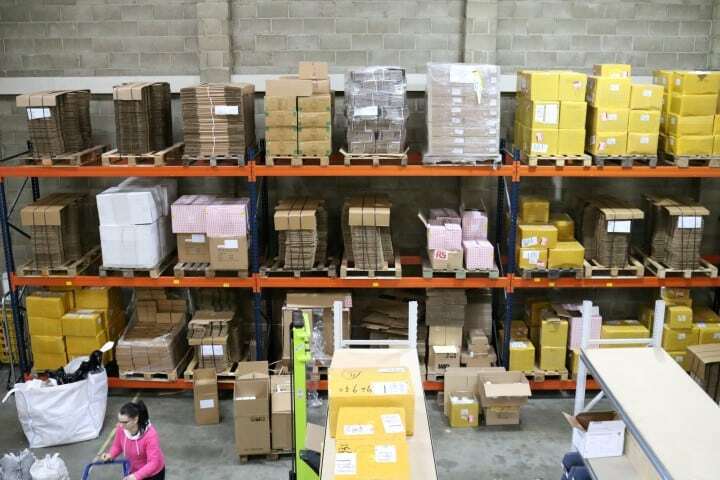 This is all the parts, packaging and bits n’ bobs that make up all the items for sale – the stuff you and I order online. Next to this were walls of little picking trays. 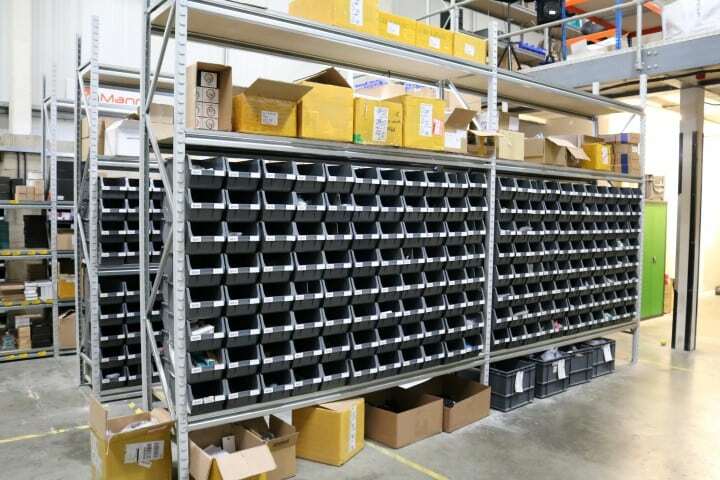 These contain all the made-up kits and small items, and are picked from here when you make an order. I met Jamie’s new recruit Nigel who was jumping from box to box as I walked past, picking a large order to go out that day. Nigel has had a somewhat ‘creative influence’ on how things are done in the warehouse, leaving artistic signs on boxes to help keep things organised. Legend. They get even smaller on the other side. 480 products there to be exact! Nigel peppers the warehouse with his flair. The next Banksy? Forget the lack of decor, these guys get free beer! 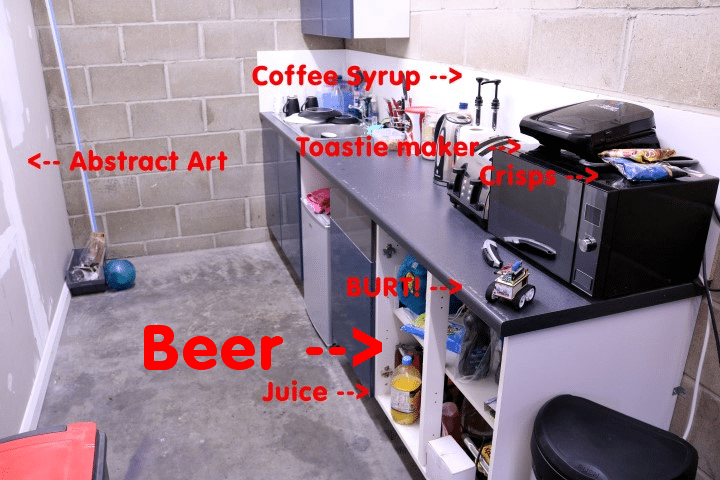 …I joke, but in all fairness, with free coffee, syrups, sweet chilli sauce, branded crisps, fruit juice, cutlery, beer and even a toasted sandwich maker – these guys are getting a lot more than I do at my office! After a year of ‘building’ the staff room, Jamie tells me that he’ll be finished ‘soon’…hmm. 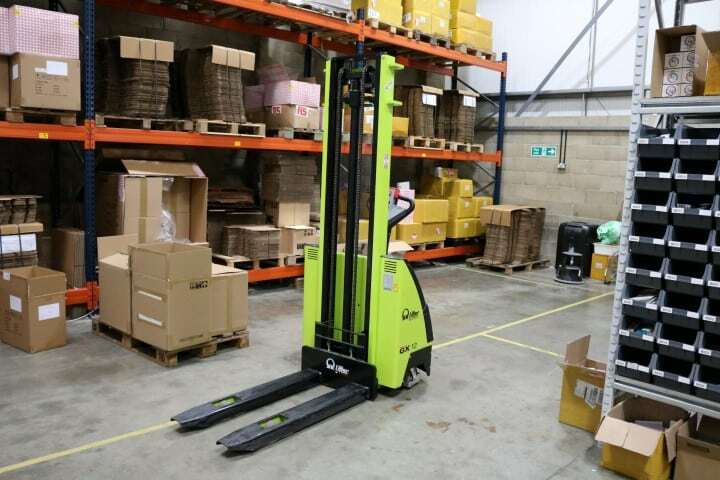 I have to mention Jamie’s pride and joy sitting on the ground floor – his fork lift. I didn’t realise how much a man could love a machine, especially a green one. Has anyone ever loved anything green? I wonder if other Pi shops have similar hardware? As I walked past a room with the rest of Jamie’s crew checking out the new camera modules (released on that day), we came to the stairs leading us to the first floor. 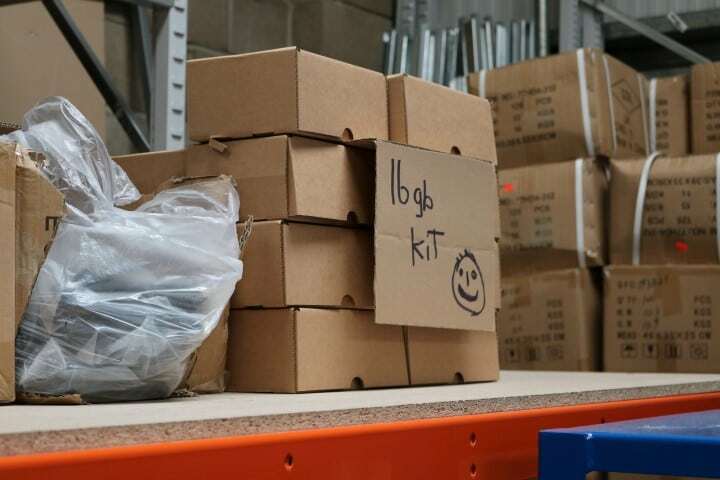 This is primarily the ‘kitting up’ area, where the team put together items to make up bundle kits and their own products. 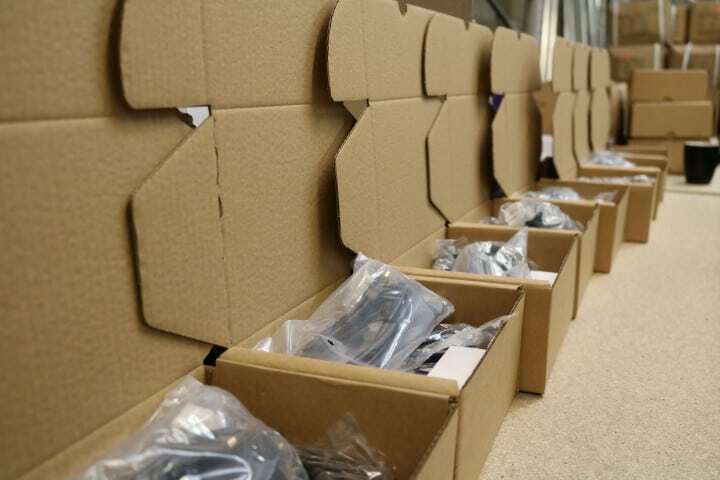 These are things like Raspberry Pi starter kits and CamJam EduKits you’ve no doubt come across. Kits are made up here here. Anything from Pi bundles to internal products like the CamJam EduKits. Where it all began. 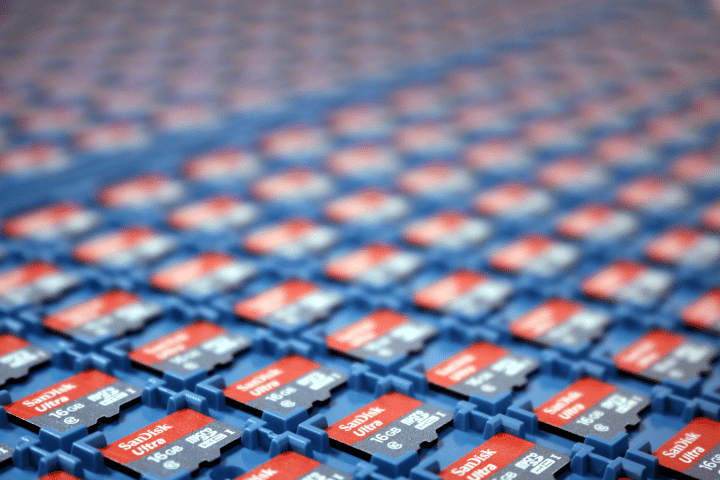 Pre-imaged SD cards are still strong sellers. In the other corner are all the packaging supplies for kits, and the scary ledge where the fork lift moves things between floors. Turns out I have a bit of a thing about heights, so I stopped here! 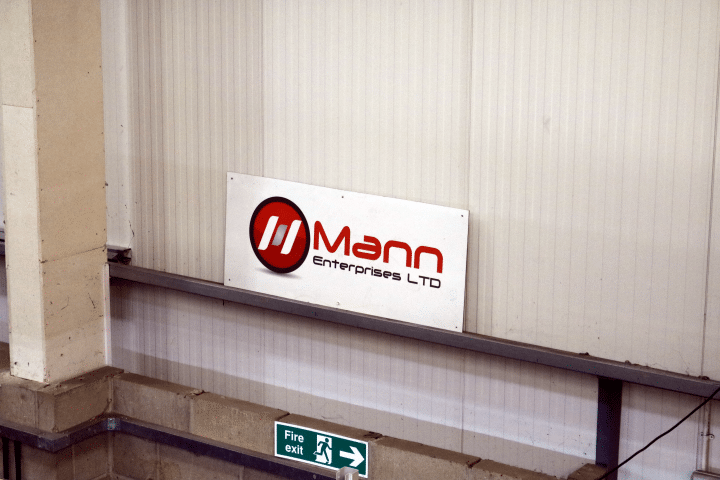 Funny story – Jamie’s old boss used to joke that he would one day own his own company called “Mann Enterprises”…so that’s exactly what he did! 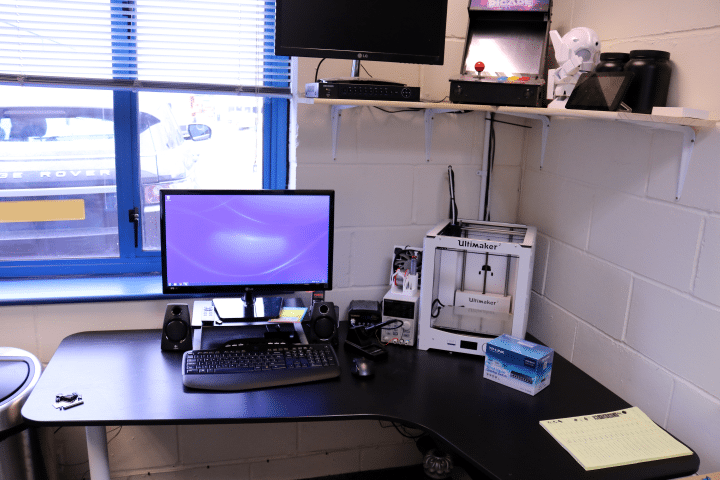 The Pi Hut is just for the Pi – aimed at those new to the scene or just interested in the Pi. That’s people like me, teachers, parents, newbies etc. I guess the device and its following is big enough to warrant its own store. Makersify is more aimed at the hackers and makers out there, that might be using the Pi or other devices such as the Arduino or Beaglebone. Whilst you can still buy Raspberry Pi stuff from Makersify, they also stock all the little bits and bobs for people that are already making their own hardware projects. It’s a wider spread. There is a bit of a blur depending on what kind of user you are (I feel I’m a bit in between), but I’m now clear on why there are two stores at least. 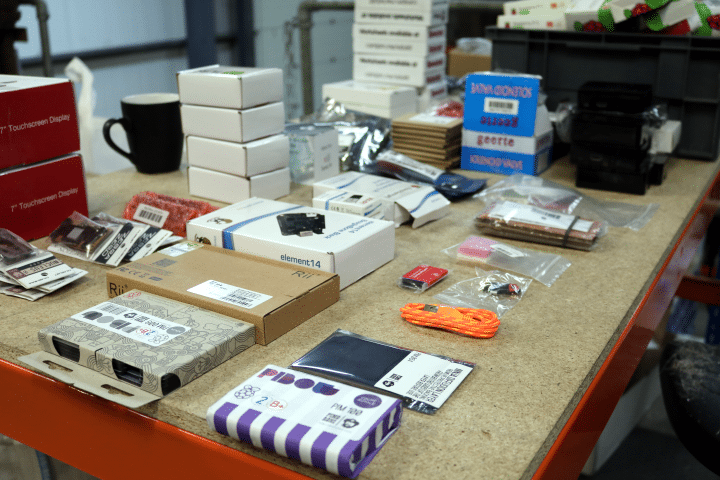 Well that was fun – my first visit to a Pi store/warehouse. I saw boxes. I saw coffee syrup. I saw smelt a dog. I met a man called Nigel. If that doesn’t stop me sleeping with excitement I don’t what will. Joking aside, it was great to finally see how these large Pi shops work behind the scenes. 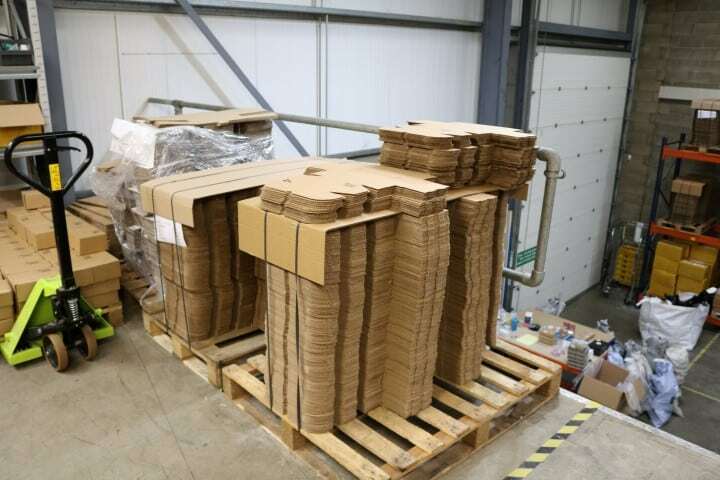 It really is fascinating to see just how much of this stuff ships around the UK (and globe) on a daily basis, and how a small team can do all that in a relatively small warehouse. Where will I visit next? 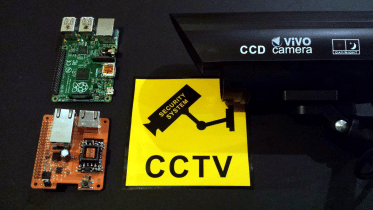 Who knows…but for now it’s time to get back to my CCTV and HEW robot arm projects. 4 Comments on "I’m In You: The Pi Hut"
I really enjoyed that. Looking forward to your next visit report. I’d not heard of Makersify before, they’ve kept that quiet. (Perhaps they should include a link on their Pi Hut ads and website as many of their parts will work beautifully with a Pi.) Now I’ve see what they have to offer I’ll be including them in my searchs for parts. The Adafruit DC Motor in Micro Servo Body [ADA2941] and matching wheels will be really useful. I’ve been trying to source parts like these for ages. 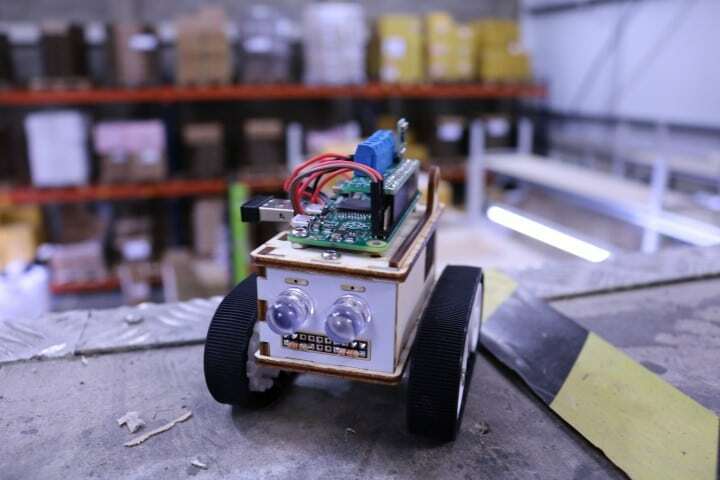 The Adafruit Mini Robot Rover Chassis Kit – 2WD with DC Motors [ADA2939] is even better value. A very useful article, thanks. Up to Sheffield to see the Pirate Monkey Robot Ninjas next?